UK Release Date - 18th January 1993. Live Track 04 - Recorded 29th May 1992 in Bonn, Germany. Special Formats - Picture Disc CD Single - part four of 'Let's Get Rocked' boxed set. Special Formats - Limited Edition 7 Inch Autographed Etched Disc. Special Formats - Numbered Limited Edition 12 Inch Picture Disc. The fourth UK single from 'Adrenalize' was released in January 1993. 'Heaven Is' was released as the next single in the UK and reached number 13 on the UK Top 40 chart. The fourth straight UK Top 20 single from the album. It was also released in Germany, France and Japan. In the UK and Germany a Limited Edition autographed etched 7" was released. 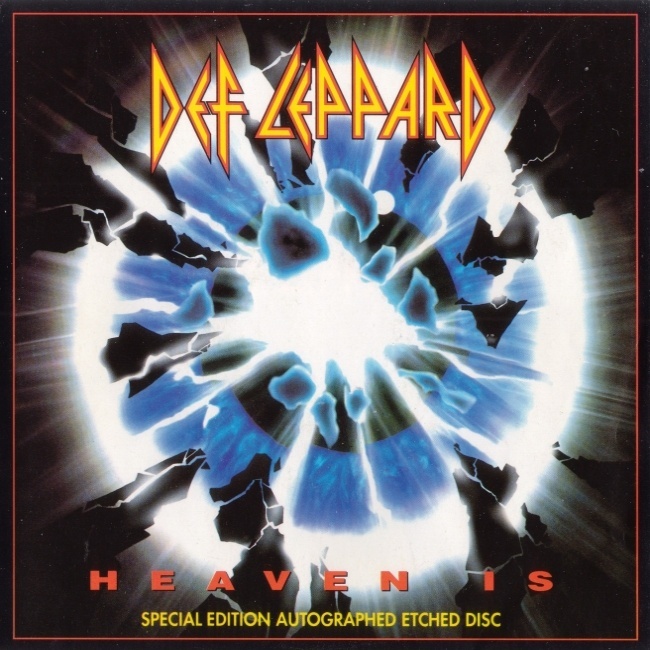 Both songs were on Side A and the autographs etched around the Def Leppard logo label on side B. A unique collectors item. The CD was part four of the CD Singles box released with 'Let's Get Rocked' fitting into the bottom right slot. The 12" picture disc had a promo shot of Joe on the back. A new Joe Elliott song 'She's Too Tough' (written in 1985) was included which had been previously recorded by Helix. A live track from Bonn, Germany 1992 and one from Tilburg, Holland 1987 were also featured. In your hands, you have the 4th Def track from Adrenalize: 'Heaven Is' - another view about that age old problem of perfect women. Backing this track is another from the obscure Elliott collection of songs: 'She's Too Tough'. The title speaks for itself!